It’s time to stop your strategy from slipping through the cracks. ClearPoint Notifications to the rescue! On this episode of the “I Didn’t Know ClearPoint Could Do That!? !” Webinar series, take a deep dive into new notification features in ClearPoint 12.0. You’ll learn how to keep your whole team up to date on the most important changes to your strategy. Today, we’re showing you all the ways you can put ClearPoint notifications to work. On our last installment, I taught Ted how to use ClearPoint! 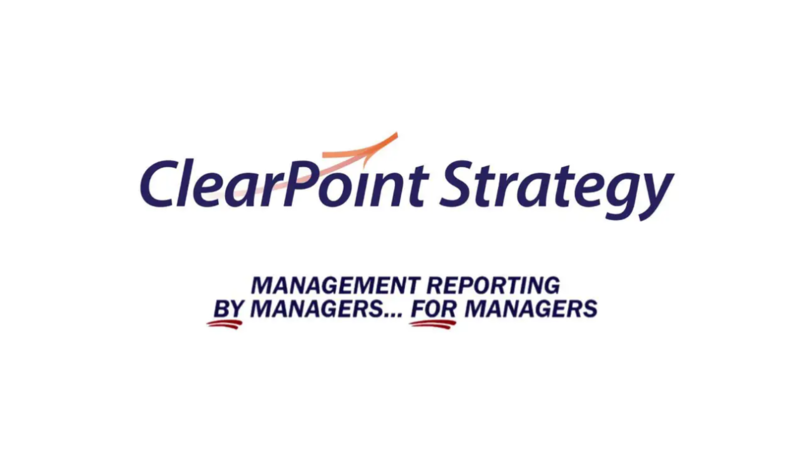 Okay, maybe that’s a bit of an exaggeration but if you want to learn a whole lot about how you can leverage ClearPoint 12’s features to supercharge your reporting process, I’d highly recommend checking out that recording on our blog, vimeo channel, or support center – just search Webinar. Now today we’re zeroing in on one of those features, and that is Notifications. And notifications give you a TON of power. Basically telepathy. Try not to let it get to your head. You might be wondering, how is that possible? Well, notifications let you set alerts for when anything important happens in ClearPoint. That way, you’re never caught unaware at a meeting, and you’re always up to date. Abby: And if you’re an administrator, you can even grant others these powers – without them having to lift a finger. Catherine: Exactly. So we’ll start by walking through how to set up a notification, and a few examples of when you might do so. We’ll finish out with a few more helpful things to know about notifications – and other changes! – in ClearPoint 12. So let’s dive in! We’re flying the friendly skies at Upward Airlines today. Now, say I just got assigned to work on a project. We can go to our Redesign Employee Satisfaction Survey and see my name under Collaborators. Abby: hey, I’m responsible for this too! Since I’m not the only one working on this, I really want to stay on top of any changes to dates, analysis, and more. After all, we’re trying to avoid duplicate work here, and if Abby’s already entered some info, it’d be helpful for me, and Joseph, and Jenna to know. So I can set up a few helpful alerts for myself, related to this one project in particular. Abby: that’s right. Any licensed user can add a notification to any individual element – like a project, measure, or objective. That means, they can get an alert here in the alerts inbox in ClearPoint, and even an email if they choose, for just about any change that gets made to that element. Catherine: Right! So I’ll just click into the Edit window, and I’ll see our Notifications tab here where I can set up these alerts. I’ll click the plus icon to add a new one. But first, we have to choose what we want to be notified of. If I really just want to stay on top of any change, this first option might be our best bet. If I think one is going to change more than the other. Now if we want to get even more specific, that’s when we’d click on Custom notifications. A custom notification is going to let you drill down, field by field, to choose what ClearPoint keeps you up to date about. And we can give this a custom name to make sure we know what it’s referring to. A really good example might be a change to the start date or end date, so you can factor in the project to the rest of your workload – we know you’re busy. Let’s call this our Project end date coming up notification. Then I can scroll down and I’ll see I’ve got all my default and custom fields here as options that can trigger an alert straight to my inbox. Once I check the box next to End Date, we’ll see a few options. If I want to be notified of any change to the deadline, whether it gives me more or less time, I can go with Any Change. If there’s a particular date or date range I’m worried about, I can set that up too – for example, I could choose Before > December 31 to be notified of anything I have coming up before the end of the year. But more importantly, just like our dynamic date filters for summary reports, you’ve got a dynamic way to keep an eye on the end date. Let’s say we want to get an alert when the project end date comes within 14 days of the current date. we’ll wake up to an alert that it’s time to get in gear for the last two weeks of our project. Abby: There might be some instances where 14 days is too close to the end to make much of a dent in an incomplete project – so there’s a few other fields you might want to track. Catherine: For sure. In any case, having that end date alert can remind you to reassess what the end date of the project should really be. That’s right – we aren’t just limited to one criterion. So let’s actually rename this to Project alert. We can capture everything useful that we would want to know about this project in this one notification. That might include percent complete, so we know whether we’re making progress towards completing our initiative. I’ll leave this set to show me Any Change. And along those lines, if we’ve completed our project, we’d definitely want to know that too. I can get an alert when Completed > Equals > True. Alright, now that we’ve got this notification set up, let’s test it out. Abby’s got her laptop here right next to me, but I can’t see what she’s typing. She’s going to make a change to this project, and we’re going to use the notification we’ve set up to sleuth out what she’s doing. We’ll watch the alert bell here in the top right for it to come through. or you are assigned to the project as a manager or responsible party, not as someone who will be directly making updates. So these can help you catch up. In any case, I just got an alert! Looks like Abby’s made her changes. I’ll click into my notifications inbox to check it out. We can see that a notification has been triggered, so I’ll click the screen icon to view it. Then I can see the before and after values for anything that triggered the alert. Now, staying on top of things with notifications isn’t just limited to our overall initiative – this goes for my milestones too. Abby: You might not be assigned to every milestone, but you’ll still want to know how they’re going – especially if it impacts the milestones you are in charge of. Catherine: Right! So maybe I want to stay up to date about the Analysis being entered for each milestone. I’ll just want to click into my milestone > Edit window, and I’ll see the notifications tab here too. By checking the box next to Analysis, I can set this to Any Change. Now, if anything goes wrong – or super well! – with a milestone, we’ll be the first to know. Abby: Cool! And the benefits of notifications don’t just stop at project tracking. Let’s walk through another situation where a notification might help. In my Revenue measure, the status is automatically evaluated, so I’m not always determining manually when it falls below target. I definitely don’t want to overlook something like that! I can use notifications to make sure I never miss an opportunity to analyze periods where we ended up below target. So I’m going to set up a notification to alert me so this doesn’t happen again. Then I can log in to explain my results, or just let my teammates know I’m on the case. Here’s how we can set that up. I’ll click to edit the measure, then click into the Notifications tab. In the new window that opens, we’ll again specify that we want this to be a custom notification and we’ll call this Red Alert. Now I’ll go ahead and check the box next to Status, set this first dropdown to “Equals,” and then “Below Plan” for this second dropdown. Then we can save this notification, and if we go to revenue and add a monthly revenue value that’s below plan, we’ll see the measure automatically evaluate and then the notification will trigger. We hear the bell go off, and if we click into the Alerts Inbox and on the preview screen we can see the notification I’ve received about the change in status. Now what if we instead want to be notified whenever analysis is added to a certain element? Catherine: There’s a notification for that too! Abby: Yep! And I know just which objective I want to track: Fun Experience. Here at Upward Airlines – and at ClearPoint for that matter – we take fun seriously, so we want to track this one closely. So I’ll just navigate to the Fun Experience objective and click to edit it, then click into the Notifications tab. Then I’ll click the plus sign to add a new notification. We’ll name this alert Analysis Added. In the next drop-down I’ll select blank so that I’ll know right away when analysis is added. It looks like that alert has triggered, so if we click into the Alerts Inbox we can see the alert we got about our VIPs’ poor experience. Catherine: Hate to see that. What a sad alert. Can you give me another example while I think of some ways to make their experience better? Maybe we should give everyone a hot chocolate at the beginning of their flight. Abby: I’m sure you’ll think of something great. In the meantime, you might be wondering how you would set up alerts for some of your more customized types of information, and I want to walk through an example of that as well. So going back to our project – Redesign employee satisfaction survey – we can see we’ve identified one risk here – that in switching survey platforms, we might encounter technical issues. Chances are, when thinking through risks, you might have some scale for determining how likely the risk is to occur, and what the impact would be. Clicking on this risk here, we can see we’ve got fields to identify Probability and Severity. And double clicking tells us each of these is a high/medium/low picklist. So we might set up a notification for this risk so that if either one of these fields is identified as High, we’ll know about it right away. We’ll label it High Risk. Then here we can check the boxes next to Probability and Severity. We’ll just set these to trigger alerts, though, when either Equals > High. And there you have it! Now, I can see whenever a high risk comes along, and tackle it right away. So to test this out, I’m going to go ahead and set the probability of this risk to high. Now that I’ve done that, I can see the alert has gone off. So I’ll just click into the Alerts Inbox and see I’ve been notified that there’s a high probability of this risk. Now, if you’re gathering feedback on your process, you might hear from your users that certain notifications have been really helpful for them. It’s simple for administrators to take those notifications and turn them into a template. For example, let’s say Joseph caught wind of the cool notifications Catherine was setting up on the Employee Satisfaction Survey project, and wanted to add his own so that he could be notified about some of his other projects too. Catherine: Glad I could be so inspirational! I can see why Joseph might need to stay in the know about different projects than me, so it’s great that he can add his own notifications – but does he really have to specify each of those fields over and over again in each notification he creates? Abby: Nope! Because you’re an administrator, we can turn your notification into a template, so that Joseph can go in and add the same notification settings to each project right from his account. To do that, I’ll just navigate back to that initiative and click to edit it, then click into the Notifications window, where I’ll click to edit the notification. Now I just need to check the box for “Set as a template” and now other users will be able to assign it to other initiatives. It’ll also turn orange so that we can easily see it’s a template. If we click on the little turquoise screen icon here, we can preview the template and ensure that it has the same settings we set up before. And actually, I benefit from this notification template too. I can go ahead and attach it to the other projects I’m responsible for, so that nothing sneaks up on me. Our notification template will show up in this dropdown, and we can select its name to assign it to this initiative. Catherine: Awesome! So if you’re an administrator, one thing you might think about is creating a set of templates that are especially relevant to your process and your users. Are there particular updates that people often overlook, or places where the ball gets dropped in your process? You can let know users know where to find notification templates to stay informed about these changes – and you’ll set them up for success even more quickly that way. But sometimes, you might want to give them a little extra push – and ClearPoint’s got you covered there too. 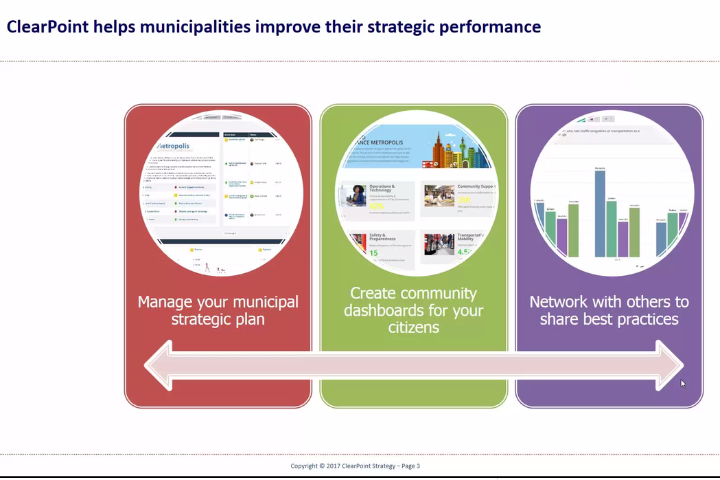 Your department heads, or assistant city managers, might not be the ones entering the data into ClearPoint – maybe they’re browsers of your account instead. But at the end of the day, they’re the ones that need to report out on it. So somewhere between the data being entered by one of their employees and your big review meeting, they need to know that the right information was updated, by whom, and what happened. What better way to do that than to use notifications! But you, as a kindly administrator, don’t want to put the task of logging in and adding notifications on these busy individuals – you just want to make certain they’re getting those alerts. We’ve made sure you can do that – Administrators can take any notification template, and specify which users should get that notification about each objective, measure, or project. We’re going to click on Notifications from the control panel, and go to the Notifications screen that only admins can see. Abby: Just to point out what we’re seeing here – we’ve got all the notification templates in our account listed, as well as notifications that I, as an administrator, have set up for myself. Catherine: Right! And I can add a new notification template here using the Add icon in the top right. So we’ll want to give this template a name – maybe we want to stay up to date about our project budgeting, so we’ll call this our Budget Changes alert. Abby: and by other users. Catherine: Right. We do have to pick an element type for our template – so we’ll select Initiatives here. Then we’ll opt to be notified for any change to our budget field. Now because this is a template, there’s one more step. We’re going to want to link this notification to any elements where we know it’s relevant – right here in the template window. So again, rather than linking a notification to an individual initiative, we’re adding all initiatives here where the notification will apply. And we can link a few here using these dropdowns. And then like I mentioned, we can go ahead and assign that notification to the user who needs to stay up to date. Chances are, different people might need to be aware of different initiatives. So for each one, I can add whichever department head, council member, or other responsible individual needs to be notified. This also creates an easy list right on this screen of who’s going to be alerted to what. Abby: Really there are no excuses not to stay informed! Catherine: Now, to start off our questions early, we have one from Joseph: What are these emails I’m getting? Are these ClearPoint notifications? This is awesome! But what if I like notifications but also want to get to inbox zero? Which brings us to a good point: don’t forget to inform your users that they might get notifications from ClearPoint! I’m sure they’ll be thrilled, just like Joseph is. But Abby, can you help him out with his email question? Abby: Well, look at the positive – it’s great that your teammates are active in ClearPoint! But we totally understand wanting to control the frequency of emails you’re getting, and you’re in luck. You can control whether or not you receive notification emails by clicking on your initials and then clicking to Edit your Profile. Here you can either select to not receive emails at all or to receive a daily digest email with all your notifications in it. Then you’ve got a couple of other options for how often you’ll be getting notifications – specifically for items you own, or have set as a favorite. If we go to the My Favorites page, you’ll see the option to Notify on changes at the top. Checking this box sends an alert whenever your favorites are changed in any way. The same thing applies for elements you own, so elements on your “My Scorecard.” You can check Notify on changes to be notified about changes to these elements or uncheck it if you don’t want to receive these alerts. Now, when Catherine got the notification before, you might have heard the annoying alert sound that went along with it. Catherine: Oh, I thought that was useful! Abby: Well, to each their own, but you do have the option to turn off the alert sounds by clicking into your initials and selecting “Silence Alert Sound”. Perfect! That’s all really helpful to know about. Now, to finish our time today, I want to switch gears a little. There’s just a couple of tiny but mighty changes coming in ClearPoint 12 that we couldn’t resist pointing out. Let’s click into Manage Scorecards to take a look. And your process just got a whole lot quicker – If I click to edit my scorecard, I’ll see I’ve got a User Access tab here, same as always. But now, if I click on that tab, I’ve got a really easy way to see who has access – and I can just check or un-check a box to change that. Abby: This is a great time saver! We actually got a sneak preview of this functionality already today in our notification templates – but I want to point it out in context of adding links. Let’s go into a new initiative we recently added to address Airport Traffic. This affects our Ground Turnaround time, which is one of our strategic objectives. So we’ll want to show that alignment by linking the initiative to the Ground Turnaround objective. The change here is that I don’t need to click into a new window to add a link. I have these dropdowns here, which will let me choose the scorecard, type of element, and specific objective I want to link, et voila! I can link it right here. And with that, we’d love to open up the floor/internet for questions! Q: WIll those email settings influence what happens when I generate a briefing book? A: Great question! So as a reminder, this viewer is referring to the email settings you select in your profile for Notification Emails. This only applies to alerts you’ve set up about changes – whether they’re custom notifications and notificaiton templates, or changes to my favorites and my scorecard. Other notices that something is complete in ClearPoint – like a briefing book export, data upload, or scorecard duplication – will be delivered no matter what. Q: When is ClearPoint 12 coming? A: It’s coming Monday night (December 17th, 2018)! We can’t wait! You’ll receive an email welcoming you to ClearPoint 12.0 then. Catherine: That’s all we have time for today, thank you so much for joining us on this episode of the I didn’t know ClearPoint could do that Webinar series – we’ll see you next time and Happy Reporting!